We work efficiently and understand that sometimes you need to get the project completed in the shortest possible time. Our team are experienced and know what it takes to get the job done, we are commercially minded and know that you need to get on with your day to day business. 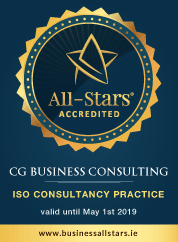 CG Business Consulting has a 100% success rate in ISO certification. Talk to us now.